I am the youngest of a blended family. Both of my parents were divorced prior to marrying each other. And each of them had children. My mother, who thought she could not bear children, adopted my brother when he was three days old. She also fostered her first husband’s nephew and niece. My father had two daughters by his first marriage. And then together, mom and dad…they had me. (Spoiler alert) Things are not like they are portrayed on the Brady Bunch…that’s for sure. Although it would be nice to have such an idyllic life, wouldn’t it? One equipped with a feisty housekeeper named Alice and overall peace and harmony among the blended family. Well, that’s not how it is. Especially when there’s a wide disparity in the ages of the children, a completely different state between them, and newlywed parents who are not getting along well together. And let’s just add a new baby in the mix for good measure. My brother and I live in the same city and we struggle to maintain a close relationship. There is a lot of tension in our relationship as he has never been fond of my father. My mother, in her dysfunction, also seemed to fear us being close as she had a “divide and conquer” mentality when it came to the kids. My sisters, who both live considerable distances away, were also fed misinformation to perpetuate the divide and conquer manifesto. It was not until I was in my 30’s that I became close to my middle sister. And I am beyond thankful for her at this juncture in my life. Sometimes, you just need your sister. It was the Tuesday after Mother’s Day…my first without mom. I managed to keep myself busy and distracted with the kids. I couldn’t even venture to her grave. I am just not ready yet. My father was peeved that I didn’t come to visit him and take him to there, but I just can’t. After all, it was my Mother’s Day too…and I needed to have a moment to regroup. My father was angry with me for this. He fails to realize that I am grieving while trying to keep up appearances at home, at work and everywhere else I venture. He unleashed a complete verbal attack and it shook me to my core. Keep in mind, that I am his only child locally…I coordinate his caregivers, I make sure his bills are paid, I am in charge of his healthcare and anything else he needs…all while doing all of the above for my own family. Needless to say, his words cut me deeply and I was shaken from it. I called my sister to warn her of his mood. After he blasts one of us, he usually goes down the list. She was next in line for the lashing. We talked about the things he said. I don’t admit this easily, but I was a basket-case. I’ve been in a funk and just can’t seem to come out of it. We talked about daddy. About mom. About the kids. About trying to balance it all. We talked about a lot of things. And then out of the blue, she changed the subject and told me about her garden. I have never seen my sister as the “gardening type”. She is a gorgeous, confident woman who was formerly a model and worked in fashion merchandising. I just don’t visualize her wearing gloves and a floppy hat, tending to weeds. But she told me about her peonies. For most Southern women, growing roses or hydrangeas is a rite of passage. Our warm climate blends well with these flowers and they can be spotted in most yards. But not her. She has a preference for the temperamental English-bred peony. “You know what I did on Mother’s Day?” she asked, “I spent most of the afternoon in my garden.” I thought to myself…wow, must be nice. I can’t grow a thing because with a toddler, a seven year old, 18 year old and 82 year old, I don’t have time to remember to water my houseplants. But I was silent, because I could sense there was a message in what she was saying. And I got it. I got the message. Kathy, being cynical and pessimistic, couldn’t manage to get her flowers to bloom. Her glass was always almost empty, as was everyone’s around her. But my sister’s flowers…they were in full bloom. And just like that, she hit my reset button. For months, I have spent my days dreading my station in life. Dreading work. Dreading the ever-dreaded phone call/guilt trip from not visiting my dad enough. Dreading a visit to the grocery store. Dreading the laundry (I do think that’s valid). Dreading everything. I had no idea how low I was until she sounded the alarm for me. She didn’t have a “heart-to-heart” conversation, telling me how I need to focus on the good. She didn’t fuss at me for not being mentally present for myself or anyone else. She didn’t judge me for being in such a state. Instead, she simply told me a story about moody flowers that bloom for some, but not for others. And it was all I needed. 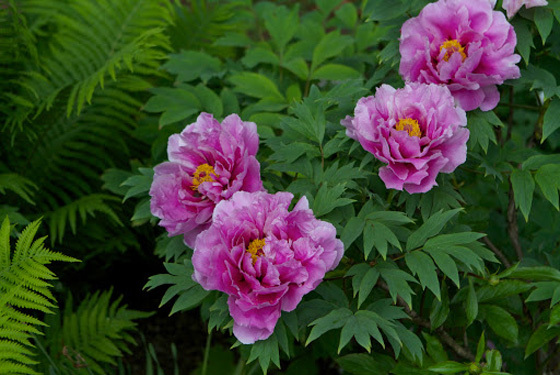 Please know that I have NO plans to invest the time and energy it takes to grow a peony. The gardening gene obviously skipped me. But I will invest the time needed to grow my family. I will tend to their temperamental ways…weeding the space around them to ensure they get the love they need to bloom. Thanks, Frankie. All my love to you. Very beautiful story. I can totally relate. I am raising 5 kids of my own (5-15), have 2 adult (just barely) step kids, I take care of my 70 yr old MIL with dementia (who lives with us) as well as being the only one who cares for my 94 year old grandmother who lives an hour away. My Mother is deep in the depths of alcoholism. Some days the dread you mention is overwhelming. The guilt for not visiting my grandma enough is huge. Thank you for your sweet comments. It sounds like your plate is overflowing. I hope you have a place of respite where you can find some time for you. I think as caregivers we forget that we need to take care of ourselves too. My father was just admitted to a nursing home for physical therapy and the guilt is even more apparent. His expectation is that I come there every day…so we are working through some things there.